How do I focus an autofocus (HD820, HD920) camera on my ProConnect NVR? If your camera is blurry, it may need to be focused. The HD820, and HD920 cameras are equipped with an autofocus lens, and will focus when you activate the zoom functions. While the HD810, HD820 and HD920 cameras are equipped with an autofocus lens, they will only focus when you activate the autofocus or zoom functions. There are several ways to access the Zoom and Focus functions. One can focus from console, through a web browser or mobile app (version 1.3 or later required). - Focus the camera by pressing the Zoom In + button, then the Zoom Out - button as shown below. - Use the mouse to right click on the image and a pop-up menu will appear. Click on "Zoom In," wait a few seconds and then click on "Zoom out." In Live view, move the mouse arrow to the top of the camera tile that you would like to focus. The + (zoom in) and – (zoom out) buttons will appear. Momentarily click the + (zoom in) button. The camera lens will zoom in a little bit and then find its focus. If you would like the original wider view of the camera, momentarily click the - (zoom out) button. The camera lens will zoom out a little bit and then find its focus. In Live view, select the camera that you would like to focus. Tap the PTZ icon at the bottom of the screen. Pinch out on the video image to zoom. The camera lens will zoom in a little bit and then find its focus. If you would like the original wider view of the camera, pinch in. If the camera is still blurry or is not focused on what you would like, repeat the zoom in / zoom out process. Depending on the location of objects in the camera’s view, autofocus may set focus on an object you don’t want. Repeating the process may allow it to find your desired focus. If you are still not able to focus the camera, you can manually focus the camera using the camera’s menu. 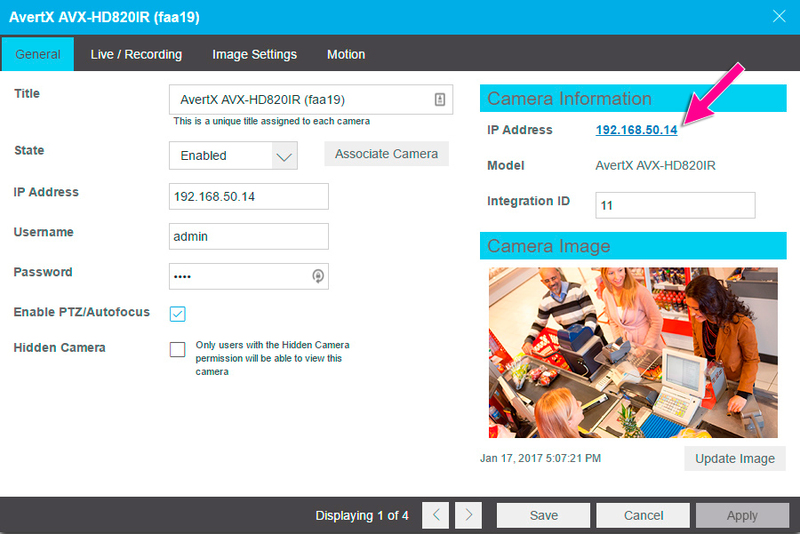 Access the camera menu by clicking the camera’s IP address in the Setup menu. Use the + / - buttons on the right side of the Live View menu. If your camera is still not focusing, please call the ProTeam for help.